The Blitz Family was arrested and taken to the transition camp of Westerbork. February 15, 1944 they were deported to Bergen-Belsen concentration camp. At the end of November, 1944 Nanette´s father died. In the beginning of December Nanette´s brother and mother were deported from Bergen-Belsen and she remained alone. Her brother died in the concentration camp of Oranienburg and her mother was deported to Beendorf to a factory in a salt mine as a slave laborer and died in April, 1945 in a train that was on the way to Sweden. In January 1945 Nanette was transferred to a different part of Bergen-Belsen known as the small women's camp. From there she saw Anne Frank in the large women's camp through the barbed wired fence. These two camps become one section and it was then that Nanette got together with Anne and her sister Margot. Nanette survived Bergen-Belsen and was rescued by a British Major, Leonard Berney. Holocaust Memoirs of a Bergen-Belsen Survivor & Classmate of Anne Frank by Nanette Blitz Konig will give you a new view into the world at the time of the Holocaust as the Jews were targeted by the Germans. After being asked a question by her grandson, Konig decided that telling the truth of the horrors the Jews faced was better than lying to the young child. Konig recounts the experiences of her happy childhood that quickly turn to a life of fear and degradation as the Jews are taken to concentration camps, treated with utter contempt and not even considered to be human by the Nazis. After the Jews were liberated, the death toll of the lives lost still continued to climb as the survivors reclaimed the life that remained to them. Anne Frank’s death was among them, a victim in the concentration camp. Even as the survivors began picking up the pieces of their lives, the nightmares of the horrors they had faced never really stopped. 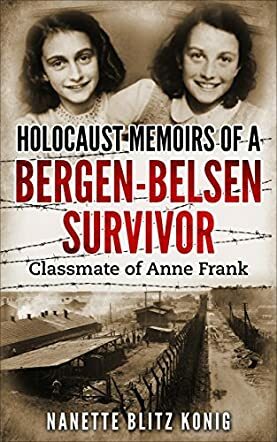 Holocaust Memoirs of a Bergen-Belsen Survivor & Classmate of Anne Frank by Nanette Blitz Konig belongs in a library next to all the other books that depict life during World War II. I loved this book but the story made me cry repeatedly as the author recounts the facts of her life in the concentration camp at the hands of the Nazis. The events and people described within the book from a first person perspective make it easy to get lost in the truth of what happened. The entire story of Konig’s Holocaust memoirs will have the most distant reader's heart breaking from the sheer indignity against humanity, then leap in utter joy as the Jews gained their liberty. I love how this story shares profound truths through the eyes of a survivor. It shows just how resilient the human spirit can be in the face of tragedy as Konig and the other survivors pull their lives back together with pride and dignity. I also want to add a huge bravo to Nanette Blitz Konig for the courage to share the real life tragedies so that future generations of the world can learn the harsh truth and not repeat the horrors of the past.